While the unseasonably warm weather we are experiencing in may parts of the country is bound to have many Americans checking their calendars to be sure what season we're in, it bears mentioning that tomorrow, February 3rd, is National Wear Red Day in support of women’s heart health! National Wear Red Day, coordinated by the National Heart, Lung, and Blood Institute, the Office on Women's Health, U.S. Department of Health and Human Services and others, is designed to draw attention to the fact that heart disease is the number one killer of women. Wear Red Day calls on heart health advocates and patients to wear a favorite red dress, red shirt, red tie, or Red Dress Pin to lend support to the cause and offer women “a personal and urgent wakeup” call about their risk of heart disease. Wear Red Day is part of the Heart Truth campaign, which is this year celebrating its decade-long commitment to women’s heart health. 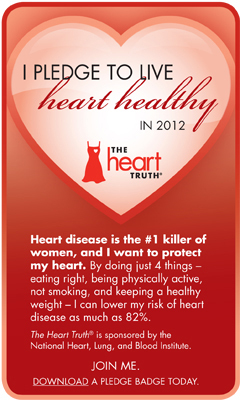 The campaign reminds Americans that heart disease is preventable. Americans can lower their risk of heart disease by as much as 82 percent just by living a healthy lifestyle: eating right, staying physical active, maintaining a healthy weight, and not smoking. We here at NCL are also very concerned about heart health and the many other chronic conditions facing Americans. To encourage the health of all Americans and to help patients have regular conversations with their health care practitioner and take all medications as directed, NCL launched a campaign of its own called Script Your Future. Script Your Future is designed to raise awareness among consumers and their family caregivers about the importance of taking medication as prescribed as a vital first step toward better health outcomes. The campaign website offers free tools such as free text message medication reminders, sample questions to ask health care professionals, lists and charts to keep track of medicines, fact sheets on targeted common conditions, and more. So visit www.ScriptYourFutre.org for more information and don’t forget to show your support of women’s heart health by wearing your favorite red gear tomorrow!